Create Direct Mail Campaigns That Deliver Results - Flottman Company. In an era of digitization, is direct mail still relevant? According to the Direct Mail Association, response rates from customers continue to increase by up to 43 percent each year and the response rate from prospects has doubled, making direct mail an effective arsenal for acquiring and retaining customers. By targeting the right audience and delivering the right message, your business can successfully engage customers and prospects with direct mail. Read on for ideas on how to get the most from your direct mail campaigns. The amount of direct mail consumers are receiving from companies has declined in recent years. Less clutter offers you the opportunity to engage better with your target audience, and personalization is a good place to start. Find ways to make each recipient feel special. For example, consider handwriting addresses and mentioning the recipient’s name in the postcard, letter, brochure or mailed merchandise. If you understand your target audience well, add things like their favorite scents on the marketing material or include small complimentary paraphernalia that will entice customers to open the envelope. Promotional content is at the heart of direct mailing. Mail recipients may read good copy, but they will act on excellent copy that addresses their pain points, clearly states a worthwhile value proposition and explains the action the recipient should take. Consider hiring a professional direct mail copywriter to help you create attention-grabbing headlines and promotional content that resonates with your audience. These days, few people have the time to read long texts, let alone promotional content. To grab your recipient’s attention within the first few seconds, keep your text simple, visible and engaging. Choose your words carefully, and use as few of them as possible to get your message through. The same goes for your graphics. Pictures do speak a thousand words, and images are important in any direct mail campaign. However, be strategic with your choice of images and the placement of these images on your mail piece. A good graphic design and printing company can help you create clutter-free graphics and accompanying text that engages readers from the onset. 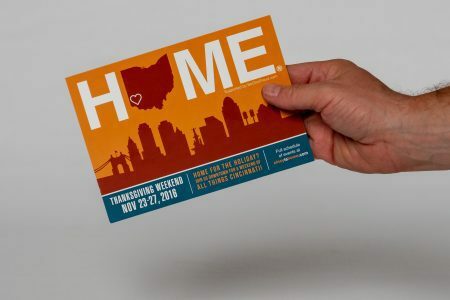 The image included is of the Cincinnati USA Regional Chamber Holiday postcard campaign. This is a great example of simplicity. The limited copy, the call to action and the color scheme all helped to drive previous Cincinnatians home for the holidays. This one component to the multi channel HOME campaign FUSIONWRX, a Flottman Company set up for Leadership Cincinnati & C-change help drive greater attendance to this year’s holiday events. Direct mail is no longer confined to mundane letters, postcards or catalogs—any business can do that. Unfortunately, many of these methods will not get the desired response rate. Today’s customers and prospects are looking for creative, fun and well-designed mail pieces that are memorable. Find ways to transform the traditional mail into something different that espouses your brand and seeks to engage the customer. For example, make use of endless folds, die cuts, odd-shaped packaging, or oversized envelopes to increase open rates. By now, consumers can easily tell a promotional marketing letter from an important piece of mail. To encourage higher open rates and engagement, consider using UPS or FedEx envelopes and sending your marketing pieces through the United States Postal Service (USPS). Find out about the applicable postal regulations for sending marketing material to avoid high postage costs that could take away from your direct mail campaign’s return on investment (ROI). Also ask your printing company about direct mail fulfillment services that can deliver marketing material to your target audience so you can focus on more important business functions. Finally, while direct mail is certainly alive and well, this marketing strategy will deliver even better results when integrated with other platforms such as social media, video, SMS, and digital content marketing. If you need help designing your next direct mail campaign, get in touch with the marketing and printing experts at Flottman Company, Inc. Learn more from another direct mail campaign designed by FUSIONWRX, a Flottman Company: Trade Show Event Mailers.